Mahdaviani, K., Benador, I. and Shirihai, O. (2015). Assessment of Brown Adipocyte Thermogenic Function by High-throughput Respirometry. Bio-protocol 5(21): e1641. DOI: 10.21769/BioProtoc.1641. Wikstrom, J. D., Mahdaviani, K., Liesa, M., Sereda, S. B., Si, Y., Las, G., Twig, G., Petrovic, N., Zingaretti, C. and Graham, A. (2014). Hormone‐induced mitochondrial fission is utilized by brown adipocytes as an amplification pathway for energy expenditure. EMBO J 33(5): 418-436. Brown adipose tissue (BAT) has the unique ability to dramatically increase mitochondrial uncoupled fuel oxidation for thermogenesis in response to adrenergic stimulation. A key parameter in assessing brown adipocyte thermogenic capacity is mitochondrial uncoupling as determined by respiration. Measuring mitochondrial oxygen consumption rate (OCR) therefore provides valuable information to study the regulation and dysregulation of fuel metabolism and energy expenditure. Adding measurements of mitochondrial membrane potential allows for more in-depth interpretation of the respirometry data. Here we provide protocols for measuring respiration in adherent intact and plasma membrane permeabilized brown adipocytes using the Seahorse XF Analyzer. In the protocol Part I, a combination of norepinephrine and free fatty acids are used to induce uncoupled respiration. 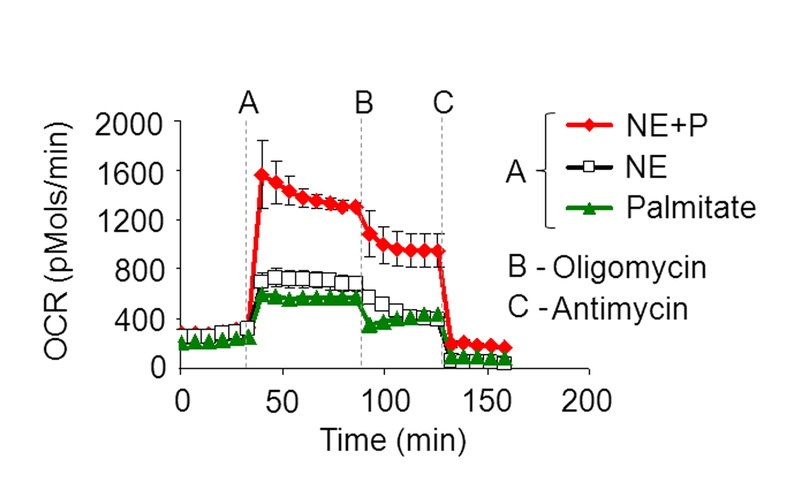 The ATP Synthase inhibitor oligomycin, the chemical uncoupler FCCP, and the complex III inhibitor Antimycin A are then used to measure coupled, maximal, and non-mitochondrial oxygen consumption, respectively. In the protocol Part II, the plasma membrane is permeabilized with recombinant perfringolysin O, a cholesterol-dependent cytolysin that oligomerizes into pores exclusively in the plasma membrane. This permits experimental control of metabolite availability without separating mitochondria from the native cell environment. Note: Rotenone, antimycin, oligomycin, and FCCP are toxic and light sensitive. Wear personal protective equipment when handling and store stocks in the dark. Note: Isolate primary pre adipocytes from brown adipose tissue, then differentiate them in an XF-24 well cell culture microplate for 7 days. Isolate preadipocytes from 3-4 weeks-old C57BL6/J mice according to Cannon and Nedergaard (2001). Resuspend cell pellet in 4 ml of BAT differentiation medium after BAT collagenase digestion and washing steps. Seed 70 μl of resuspended pellet into each well of a V7 XF 24-well cell culture plate, allow cells to attach for 1 h in cell culture hood, and then add 180 μl BAT differentiation medium and put in 8% CO2 incubator (getting an exact cell count is difficult at this stage because of the debris and red blood cells left over from isolation procedure). The next day, gently wash the cells twice with 150 μl medium to make sure that the red blood cells are washed out and add 250 μl of fresh medium. Replace the medium every other day for the next 7 days or until the preadipocytes differentiate. 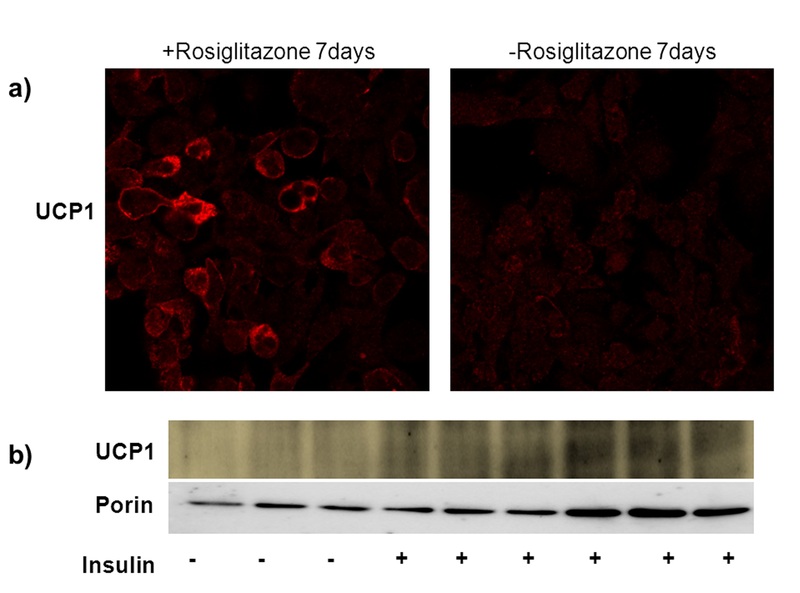 Differentiation can be visualized by lipid droplet formation in adipocytes or assessed by Western blot analysis of UCP1 expression (see Representative data Figures 1 and 2). Before beginning the respiratory assay, soak the cartridge with 1 ml of XF Calibrant per well for at least 3 h in CO2-free incubator. Wash cells once with SH assay media and then add 450 μl of SH assay medium to each of the 24 wells in the plate. Incubate plate for 30 min at 37 °C in CO2-free incubator before loading into the XF 24 extracellular analyzer. During these 30 min, load the ports of the cartridge containing the oxygen probes with the compounds to be injected during the assay (50 μl/portA, 55 μl/portB, 60 μl/portC, 65 μl/portD) and calibrate the cartridge. Run seahorse assay with 2 min mix and 4 min measurement (no wait). 6 measurements under basal, 5 measurements after Oligomycin and FCCP injection and more than 5 measurements after Antimycin A injection are recommended. Successful NE activation of brown adipocytes expressing UCP1 results in a rapid increase in oxygen consumption rate. If OCR increase is <3-fold this suggests the brown adipocytes have not been sufficiently differentiated. Prepare cells as described in steps 1-2 of intact brown adipocyte respiration protocol. On the day of experiment, thaw 1x MAS and pre-made substrate solutions described in Recipes section 1. Prepare 10x solutions of inhibitors in 1x MAS. If using fatty acid substrates, prepare them freshly as described in Recipes section 2b. Soak the cartridge for at least 3 h in CO2-free incubator before loading. Load ports: 50 μl in Port A, 55 μl in Port B, 60 μl in Port C, 65 μl in Port D and calibrate cartridge. Prepare 7.5 nM PMP in 1x MAS in a volume sufficient for 450 μl per well. Gently wash cells with 1x MAS buffer one time. Completely evacuate wash and add 450 μl 1x MAS with 7.5 nM PMP. Incubation in CO2-free incubator is not necessary. Immediately load the plate and run seahorse assay with 3 min mix and 2 min measurement (no wait). Make 2-3 measurements per condition. 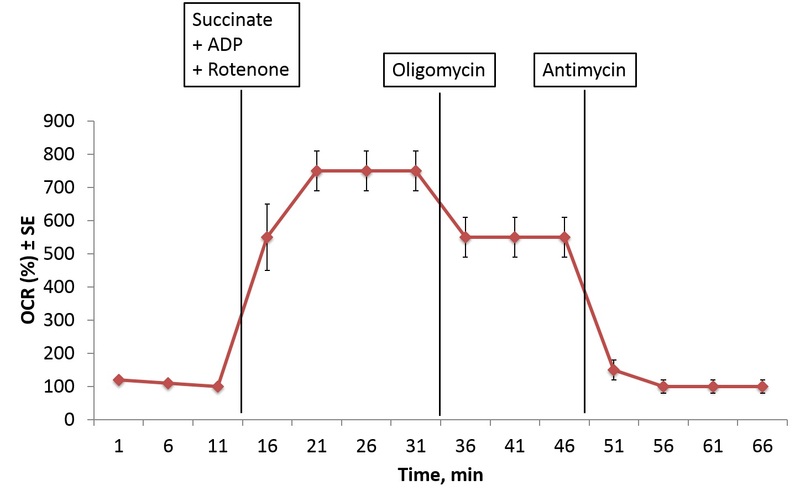 Do not exceed 1 h of assay time preceding Antimycin A injection as mitochondrial integrity will be compromised. Always load all four injections ports. If one port is not used, load with 1x MAS buffer. Use at least three technical replicates per condition. To ensure the quality of the data, make sure that pH is stable throughout the run and that oxygen tension returns to base level after every measurement. If OCR exceeds 2,000 pmol/min, go to ‘Special Operations’ tab in the seahorse excel data viewer, click on ‘Change O2 calc method’ and select the ‘Gain (Fixed)’ algorithm as the AKOS algorithm will not process high OCR data correctly. Always express Gain (Fixed) data as percent of baseline measurement. For more information on permeabilization see Divakaruni et al. (2014) and Salabei et al. (2014). pH to 7.2 with KOH. Solution is strongly acidic, calculate molarity according to final volume. Prepare succinate, malate, and pyruvate in 1x MAS buffer and pH with KOH to 7.2 prior to day of experiment. Sterile filter, aliquot, and store in -20 °C. For every 100 μl of additional volume as a result of pH titration, add 50 μl 3x MAS to maintain osmotic strength. For example, if final volume of the 5 ml succinate solution is 5.1 ml, add 50 μl 3x MAS. This will result in a slight dilution of reagents that should not significantly affect the assay. However, given this variability, we advise preparing a large batch of solution and use the same stocks for all experiments within a given project. For fatty acids, prepare solutions of additives (except carnitine) in 1x MAS buffer and pH with KOH to 7.2 prior to day of the experiment. Sterile filter, aliquot, and store in -20 °C. Add carnitine and fatty acid to solutions on the day of the experiment. Permeabilized brown adipocyte respiration protocol adapted from Divakaruni et al. (2014). This work was supported by National Institutes of Health grants R 01 DK074778, R01 DK56690-11 and by the Swedish Research Council as well as DIABAT FP7, collaborative EU Grant HEALTH-F2-2011-278373 and the Wallenberg Foundation. Cannon, B. and Nedergaard, J. (2001). 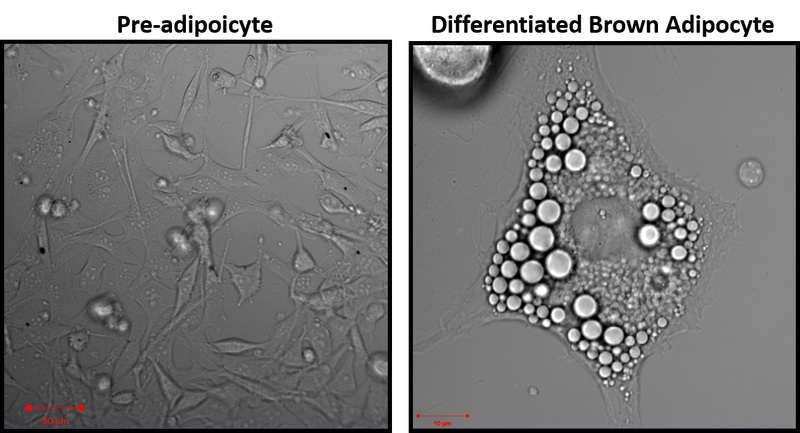 Cultures of adipose precursor cells from brown adipose tissue and of clonal brown-adipocyte-like cell lines. Methods Mol Biol 155: 213-224. Divakaruni, A. S., Rogers, G. W. and Murphy, A. N. (2014). Measuring mitochondrial function in permeabilized cells using the seahorse XF analyzer or a clark-type oxygen electrode. Curr Protoc Toxicol 60: 25 22 21-25 22 16. Salabei, J. K., Gibb, A. A. and Hill, B. G. (2014). Comprehensive measurement of respiratory activity in permeabilized cells using extracellular flux analysis. Nat Protoc 9(2): 421-438.